just got a whole lot worse with the news that the one time Scotland starter has undergone surgery on an injured bicep that, according to his club, will rule him out for the next 10-12 weeks, effectively ending his season. From 2012-14 the Glasgow prop was Scotland’s starting loosehead but he has since been usurped by Edinburgh rival Alasdair Dickinson, who played the big games in the World Cup in the front row, with WP Nel at tighthead. Grant’s last international appearance was against the USA Eagles when the reserve props were given an old fashioned hurry up at the set scrum and both men had to be replaced at half-time. 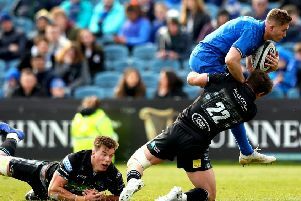 Relatively small for a modern prop, the change in the scrum engage laws probably did Grant few favours because it reduced the impact, literally so, of his speed on the “hit”. Grant’s World Cup was eventually cut short by injury and his place in the Scotland squad was taken by Edinburgh’s Rory Sutherland, who is likely to be on the bench in Rome for Saturday’s clash with Italy.